On the highest plateau in the world (Lhasa), the desert like whole landscape and the roads seem as if they are joint with horizon. First, arrive in Kathmandu and few days latter we start motor bike tour to Tibet. The Motor Biking tour experience brings you in close experience with the three religions Buddhism, Lamaism and Hinduism in contact. The Tibetan culture, the country and people make this journey a great event. You will start this tour from Kathmandu and ends with Kathmandu.You will follow the route to Zhangmu, Xigatse and you will tour to Lhasa. You will also follow the route to Everest Base camp while you are back. We will provide camping or lodge accommodation along the way. 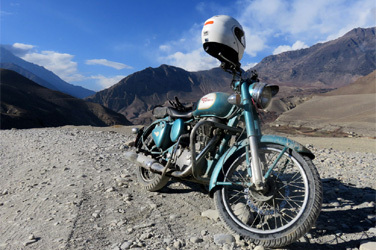 This tour also called "Royal Enfield tour" because we use Royal Enfield Motorcycle on that tour. Day 01: Arrival in Kathmandu andtransfer to Hotel. Day 17: Drive to Kathmandu from Nyalam.